I think by the time I was this old I was probably steering by myself, but we got a late start. He was not very comfortable and didn't want to let go and turn to face front, but he did relax enough to smile. And he really enjoyed patting the horses, he wasn't scared at all from the ground. 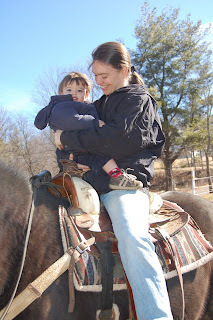 He also took advantage of all the other great things at the barn, a cat that didn't run when he wanted to pet it, the boot scraper to clean off the mud, and maybe his favorite, of course, the 4-wheeler. 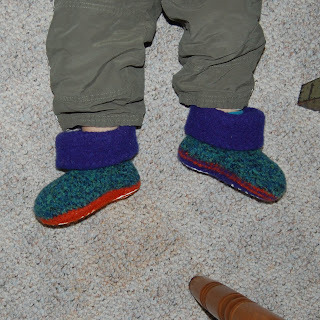 I made these new slippers for him this week, his old ones were starting to be too tight in the toes. These are a bit huge and should last a while. They are the Alpine Boots from Fiber Trends made with Cascade 220 left over from Kevin's clogs. 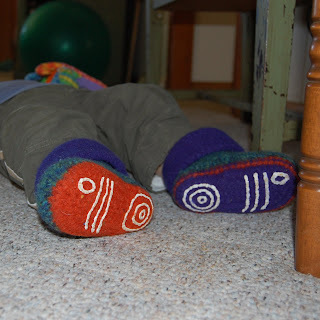 A little puff paint on the bottoms to keep them from being too slippery in the kitchen. Wait - you were riding solo by that age or you were steering? Either way - wow! I was so scared of getting up on a horse. I don't think I did it until I was about 10. And I think I only got to do it once if I remember right. Heh. Love the little slippers. The puffy paint is too fun. 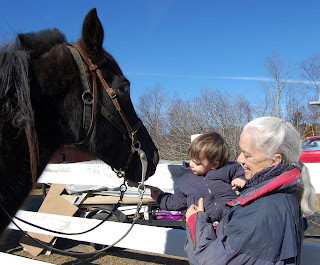 My kids had never really been around horses until last summer when they went to a riding camp. I was surprised at how comfortable they were around horses. 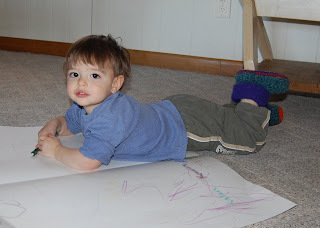 Too cute -- both the kid and the slippers. What a clever idea to put traction on the slippers! I will have to remember those slippers! Super cute.